Good Monday all . welcome to December 14 , Christmas is getting closer and closer . If you are looking for a sweet book to read over the holidays . Check our HERSHEY'S KISSES by Darlene Fredette. 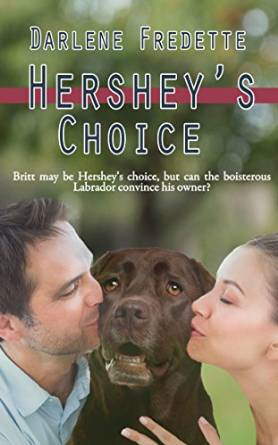 I am a sucker for a story that has a dog in it , so when the author showed me this one . I had to get it . Let me introduce you to Ryan , Britt and Hershey. Ryan is an engineer, who has a promising career and wants a future with a woman who loves him and his dog. One day at the park Hershey decides to go for a run and right onto Britt, knocking her coffee all over her new jacket. Its not like Britt was having a good day either . She is a wedding planner and just a little crazy . Will they survive the weddings the mother n law from hell , to find the love that they are looking for in each other. Your review is spot on. This is a wonderful story. Your review was spot on. this is a wonderful story.